After the Rocky Mountain Fire scorched much of the earth nearby and closed access to the Argow Cabin, we had to make new plans for our weekend in the woods. 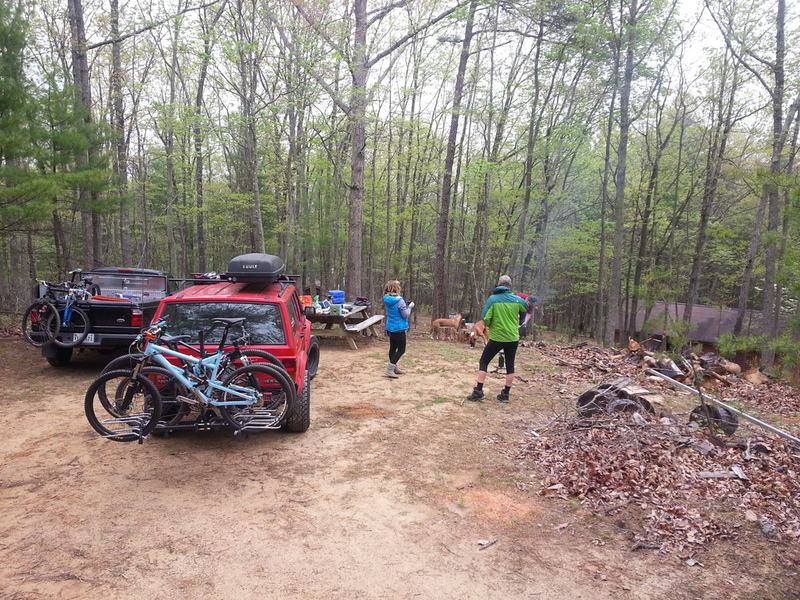 I'd heard about some extensive trailwork surrounding the newly built Stokesville Lodge and was delighted to learn that camping was still permitted on the same site, so we headed towards Harrisonburg to check it out. Camping on the site cost $10 per person - well worth the price to have so many singletrack options leading you into the woods from your campsite. Joey and I chose a loop to Lookout Mountain while Rebecca, Paul, and Eryn checked out the trails within and around the campgrounds with the dogs. Our ride was stellar - technical climbs and dicey, fast-paced descents with rocks strategically placed to divert water and send us flying into the next corner. 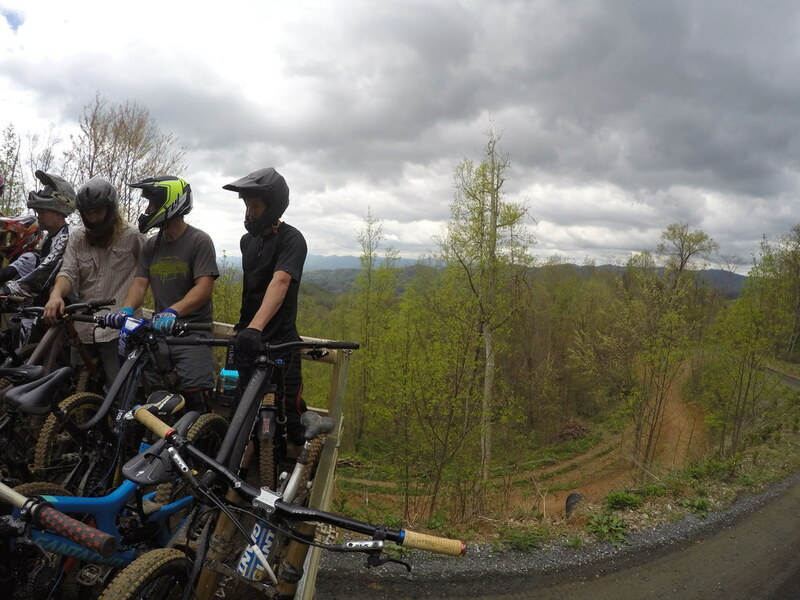 After the race in March, I've been itching to ride the rest of the trails at Bailey Mountain. The endless berms and jumps looked too good to pass by. My favorite trail was called Banshee. It was a jump line that wound back-and-forth between perfectly built corners and jumps/landings. 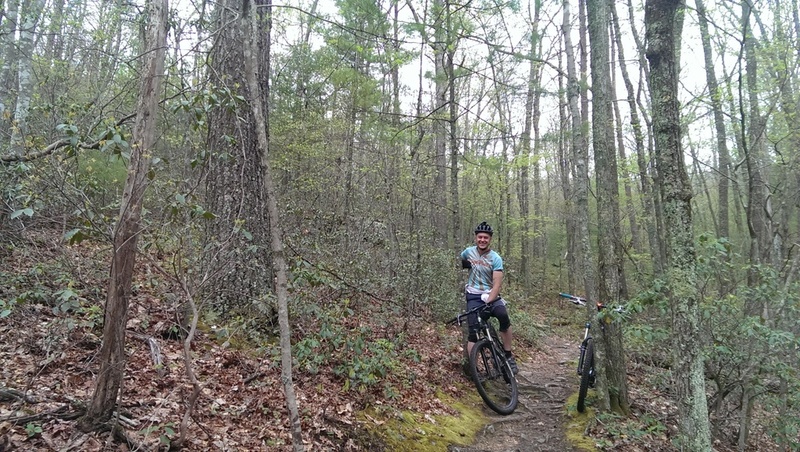 For this visit to Bailey, I researched my camping options a bit more and found a great spot within the Pisgah National Forest. I let the dogs sleep in the Fiesta, while I bedded down in my hammock. As a test of my new bike's abilities, I decided a one-night camp would be a suitable first outing. 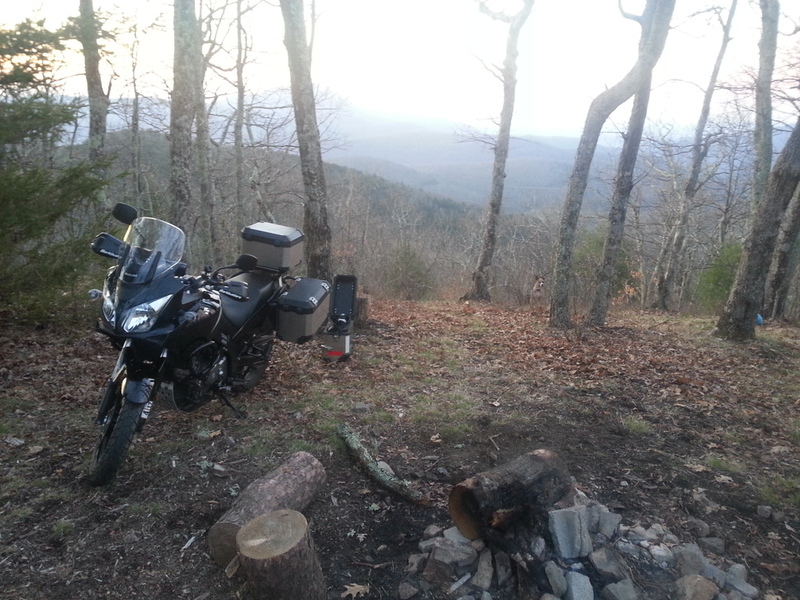 I chose a familiar destination with all the elements of an adventure ride: highway, twisties, and light offroad. On this trip, I had plenty of accompaniment - Rebecca drove the Feista with the dogs and our friends Paul & Eryn joined us in their Ford Ranger 2x4. I still packed as if I'd be self-sufficient. As a matter of fact, I packed MORE than I would on my own, since my boxes included two sets of hammock gear and Rebecca's full-face helmet in case she'd like to ride near camp. I had absolutely nothing hanging or strapped to the outside - the SW-Motech boxes worked splendidly. Not only that, but the weight kept me planted on the road, with zero push from the sidewinds. I had a theory that the "non aero" qualities kept more of a "pull" in the forward/rearward direction, which accounted for this arrangement feeling even better than with passenger. We drove one stretch from Richmond to Charlottesville, then a small push to exit 99 onto the Blue Ridge Parkway. On the highway, the bike was comfortable. I felt fine with arms resting on the bars and feet squarely planted on the pegs. I doubt I'll need any tweaks of the riding position for all-day stints. Once on The Parkway (in the dark, on only the second bike I've ever owned) I stayed much closer to the speed limit of 45 and enjoyed the surprises in the form of deer spottings and one near-smear of a raccoon scampering across the road! At a certain undisclosed location, we continued on fireroad to our campsite. We emptied the Fiesta and made this stretch with bike leading 2x4, filled with dogs and chicks. 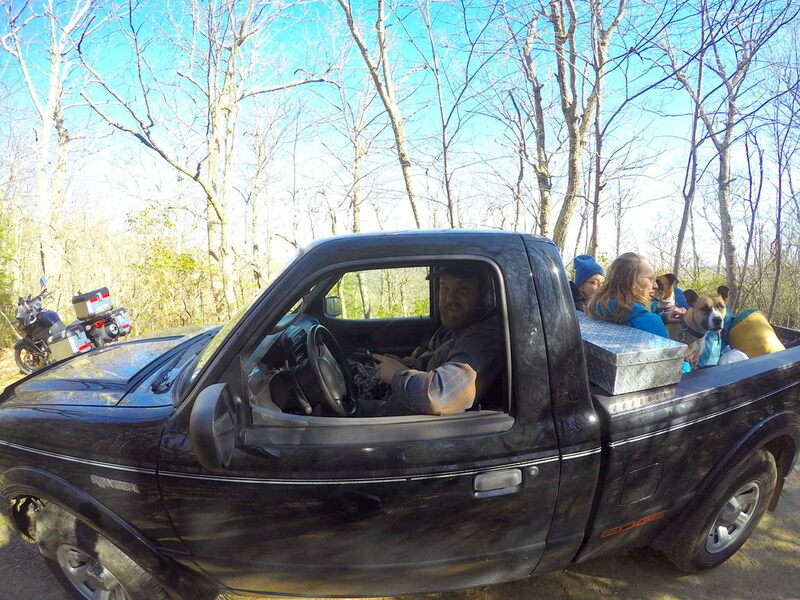 This was the first time Paul'd made a run offroad in the first truck he's owned - and he ATTACKED the trail. I was moving kind of quickly in order to have some momentum moving uphill, but every time I'd pull over to look back he'd be bouncing up the road behind me. It was great to see the look of joy on his face as we both made pretty quick work of the ruts and rocks. I had only my center box for the drive up the hill, but in retrospect I think the outcome would have been the same. The suspension and tires felt fine as I tried to navigate wisely and turn into or around obstacles with intent. There were only slight "bar twisters" but a loose but aggressive style seemed to be the answer to these surprises. I'm a bit used to the feel from mountain biking, but the key to motorcyles seems to have more to do with the lean and your weight over the bike. Once we'd reached the windy ridgeline, Paul immediately started a fire and we huddled around. The dogs explored as we set up camp for the night. Since we're insane, and have THREE dogs, I slept in the hammock next to the tent while Rebecca kept herself cozy with the mutts. Ruprecht, though, wimpered on and off at my absence. 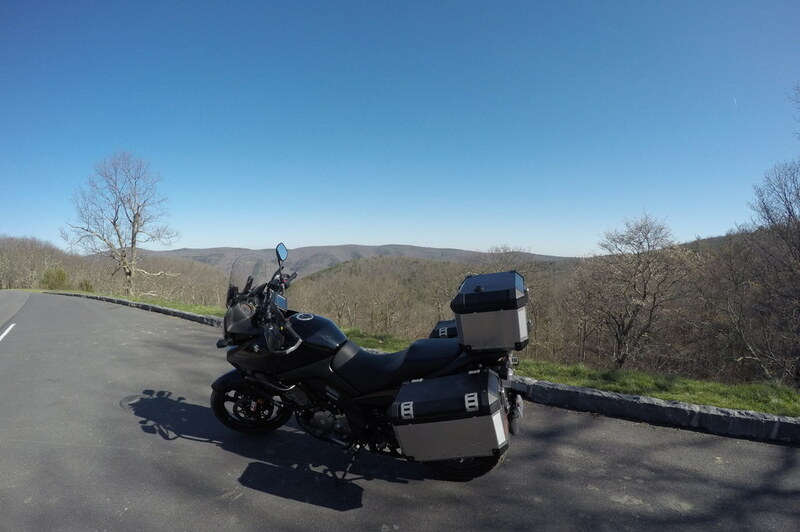 In the daylight, the Blue Ridge Parkway was magnificent! The corners were exhilarating - matched only by the views. On my jaunt home on 64, I used the add-on pegs for another foot position which really helped relieve the monotonous saddle. The large windscreen shielded me well as I stood during some of the slower paced (55mph) sections to stretch the bum. In no time I was east of the city, as I headed to the Chickahominy River to help Peyton pour some concrete post holes...paying ahead some pulls behind the boat this summer. 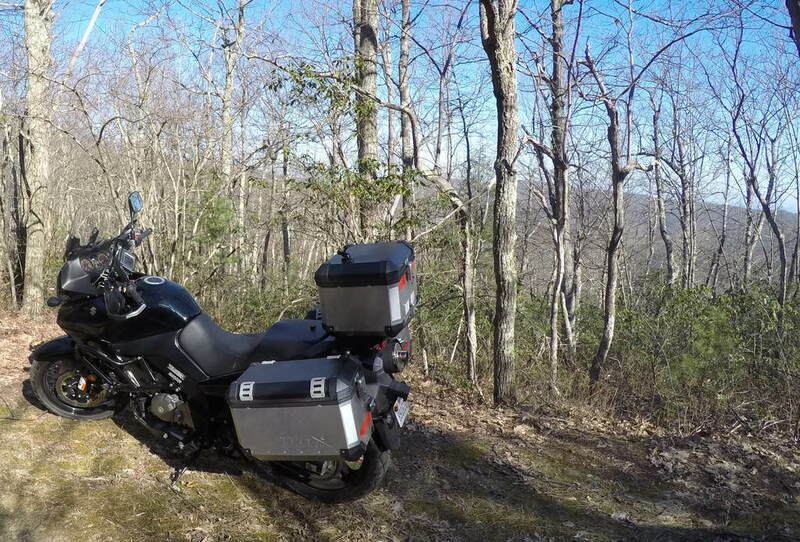 I pick up my new bike tomorrow from Gainesville, VA and already I've begun planning the epic trip which inspired its purchase. I found some great online resources to design my route from Richmond to Austin. Along the way, I'm hoping to spend at least a portion of the journey on gravel or dirt. The Sunday Morning Ride is quickly building a collection of offroad rides by state. 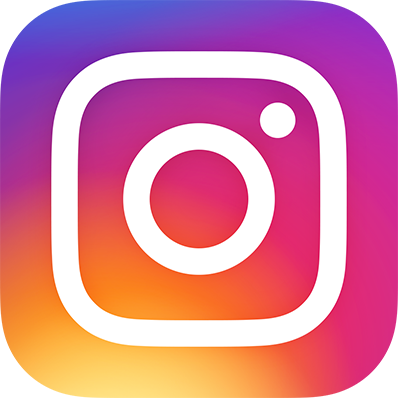 As far as I can tell, their reports are fueled by readers, so it will continue to grow as the site gains popularity. I scoured their lists to find loops which I'll merely run in one direction along my route to Texas. 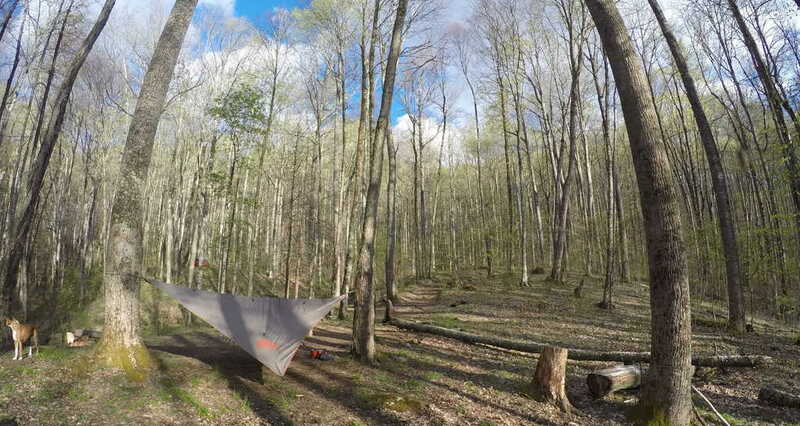 Since I prefer to spend my nights in the hammock instead of a bed, I used the FreeCampsites map to narrow down a site at each of my nightly stops - one in the Chattahoochie Nat'l Forest and the other in the Homochitto Nat'l Forest. This map doesn't show the spots where I rerouted for more rural roads (like the Natchez Trail and the Tail of the Dragon), but it does illustrate the main destinations.